Milton Jones, lord of the one-liner and Mock the Week regular, returns next month with his new tour Milton Jones and The Temple of Daft. Only this time around, gag-machine Milton – the man who can cram in up to 250 gags a night – is heading into uncharted territory; narrative comedy. Stringing his signature quips together into a broader story, Temple of Daft will see Jones taking on the mantle of intrepid explorer, taking us through the dense jungle of the surreal. We caught up with Milton to talk about big hair, bad shirts, Mock the Week and his new direction. Your tour is called The Temple of Daft. Why? Basically, previous tours have been lots of jokes in different forms, but basically lots of jokes. This is more of a story, more like one of my radio shows. It loosely, and I say loosely, follows a kind of adventure-archaeology type story. It started off with me noticing that I had the same surname as Indiana Jones, and it has all transpired from that. Do you wear a hat? Do you have a whip? I do wear a hat at one point, not for the whole thing, ‘cause then people would never see my hair. You talk about using a narrative style, and you say this is a bit of a departure. What brought that on? Two things: when people see you on telly, they want to come and see the same sort of thing when they see a live show, but obviously not the same jokes; moving to a narrative was a way of keeping the same style. It begins to mine other areas of jokes as well, in terms of, if you can do a scene where you’re talking between two people – even though I’m the only person there – that’s a different sort of writing than just one- liner after one-liner. How do you prepare for a tour? Anything that I have written during this tour will go into the next tour. I’m amassing jokes from the moment my last tour begins, and then once it finishes, I begin to go to little out of the way places to test them. Generally speaking, the further you travel, the more pleased people are to see you. I will go with bits of paper and ideas, and it will be throwing mud against a wall and seeing what sticks. Eventually I’ll accrue enough material to do try-outs nearer home. So, it’s a trial and error process from the beginning of that. Years ago I started as an actor, and I’d quite like to incorporate more of it. For instance, previously the footprint of the tour has been I’ve gone on and done 15 minutes as a character, and then there’s a support act, and then I do the whole second half. There’s a different character this tour. Previously, I’ve done my granddad, but this will be a different relative. This is my uncle, my great-uncle, Sir Randolph Digby Jones. He’s an explorer, I quite like warming the audience up with an obscure character to begin with, then making it more of a show. Your schedule is preposterous. How do you remain sane? Is there a Milton Jones signature workout regime? I try and see as many people around the country as I can, friends and relatives. Because there’s nothing worse than talking to hundreds of people, and then being the last person out of the car park, go to a hotel, and then the next time you talk to someone properly is when you talk to hundreds of people the next night. That’s a recipe for madness. What do you do to re-energise? Me and some other comedians get together – I did it yesterday – and play football. We like it because we see each other, but also it’s one way of turning your head off, to become completely involved in something else. Isn’t that football match full of people trying to outwit each other? Well, to be fair, there are about five different running commentaries. A lot of your comedy is quite word based – can you just come up with it? No. It’s all about writing as much as you can, and then taking the top 10%. There’s lots of stuff I’ve discarded. The new show will have between 200 and 250 jokes, probably, but that doesn’t mean that’s all I’ve written; I’ve written another 100 that I’ve put in the bin, at least another 100, probably, maybe three times as much, and that’s the hard work. Even after all this time, I’m thinking I have just written the best joke ever, and I go and do it and it just doesn’t work – however, the thing I improvise off the back of it does work. But, I wouldn’t have got to that place had I not tried the first one. Do you have books and books of jokes that you might return to? Do ‘the Jones files’ exist in a filing cabinet somewhere? Never throw anything away, is my motto, in that if you thought there was a seed of something that was funny, keep it on file. Especially one-liners because one syllable, one word, changing the picture in people’s heads, can suddenly make something work that didn’t before. Has being known as the king of the one-liner ever been an encumbrance at all? Yeah I mean, in a way, I’ve got to be grateful… people want to put you in a box, so that originally it’s people who are booking gigs; they want to know what type of comedian you are to fit on a bill. And I think that’s true of television as well, to some On Mock the Week, I sit in the one-liner chair, and if it’s not me, it’s Stewart Francis or Gary Delaney – you know, it’s the ‘odd’ bloke, so that has gone in my favour. I’m sort of grateful for where it’s got me, but if I go for an audition for another show, albeit a sitcom or something, it’s quite often as the crazy neighbour. You think; well, I’m glad I’ve got this audition, but it’d be nice not to have to do that role forever. So, I suppose this show is me trying to move things on. Tell me a little about Mock the Week. Do you have to mug up, read all the papers beforehand? It’s a bit like doing an exam in that we actually get some stuff beforehand, but the list is so long that basically it’s every story that happened in the news that didn’t involve someone dying over the last week. So, there is no way I can cover all of it. You just hope, like an exam, that the bit you’ve revised comes up, because it records for nearly three hours for a half hour show. You hope that the 10 minutes you zoned out for isn’t the 10 minutes that appears on television. When I know I’ve got Mock the Week in the diary, I think, oh, it’ll be nice to see those people again, but it is hard work, there’s no escaping that, especially after you’ve done quite a few. When you get a group of funny people together in a programme is it competitive? I’ve known lots of those guys for years and we all get on and it’s fine. But the way it’s set up, it’s always seven people trying to get through a door for two. I can’t tell you how many times I’ve had a joke that would have fitted, and I just couldn’t get a word in. But I suppose from an outsider’s point of view, that is where the dramatic tension is, because you’ve got all these people trying to get a word in. It kind of makes for absorbing television. A lot of your stuff is family friendly, and you’re sometimes called a Christian comedian – do you think that by going against the flow it’s served you rather well? Yes, although it’s not a conscious effort: I’m not thinking how can I be different to this. I’m just doing what I would find funny myself, hopefully. And I think it is true that I get a very wide demographic, as a result, coming to my tours, because…it’s partly having done Mock The Week and Radio 4, those two ends of the human life scale. And it’s kind of accessible in a way that people feel happy to come as entire families, which is great to look at. It gives a slightly pantomime feel to a tour show because I know that there are grandparents who come with their grandchildren. I like that idea, it feels less niche and I quite often have to explain things, or a child will put their hand up and ask a question during a show, or it’s clear that some grandparents have brought some other grandparents with them. What’s your hair care secret? How do I get the Milton Jones look? Well, I did use to use wax, but actually under TV lights that’s not so good – it wilts, because it’s hot, and that’s not good. So now I use something called Backcomb Dust, which is actually far drier and keeps your hair higher for longer. And finally, we have to ask – where do you get your shirts from? Usually retro shops around about. It’s tricky with shirts because people think, ‘Oh zany shirt!’ but actually the zaniest of shirts is too much. What I like are shirts that people go, ‘Oh that looks… hang on, is that good or bad?’ It needs to be quite subtle, in a way, and I’ve got 100s of them. But yes, they are usually from Oxfam or retro shops where the old lady says, ‘Oh, that looks just you, that does,’ and they’ve no idea who I am. 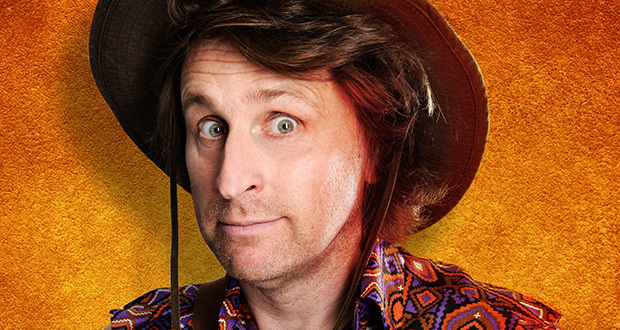 Milton Jones will be bringing his The Temple of Daft to Middlesbrough Town Hall on Friday 20 November, at 8pm. Tickets: £24.00, available online or from the Town Hall Box Office on 01642 729 729.